Researchers have developed a new nuclear medicine tracer that could improve diagnosis and treatment of non-small cell lung cancer. Research published in the November issue of The Journal of Nuclear Medicine found that the new tracer, 99mTc-HYNIC-cMBP, produced clearer images in less time than currently used tracers and was more rapidly eliminated from the body, reducing radiation exposure. The c-Met receptor—a promising therapeutic target for this disease—is a tyrosine kinase receptor that promotes the growth of cancer cells, particularly in NSCLC. When c-Met receptors are elevated, cells may be resistant to EGFR-targeted therapy. However, with precise targeting of the c-Met receptor, physicians may be able to more effectively treat this disease. In the study, the novel radiotracer was developed and cultured in two NSCLC cell lines, H1993 (high c-Met expression) and H1299 (no c-Met expression), and the activity and uptake of the 99mTc-HYNIC-cMBP tracer was assessed. These tumor cells were then transplanted into mice, and in vivo tumor specificity was measured by SPECT at various intervals after injection of the tracer. Blocking assays, biodistribution and autoradiography also were conducted to determine the tracer's specificity. The authors found the preparation of the 99mTc-HYNIC-cMBP imaging agent to be simple, providing a high yield of the tracer with few associated costs. Biodistribution and autoradiography showed significantly higher accumulation of 99mTc-HYNICcMBP in H1993 tumors than in H1299 tumors. In addition, the H1993 tumors were clearly visualized after only a half hour in SPECT images, while the H1299 tumors were not observed at any time. The tracer was also cleared rapidly, which is favorable for reducing exposure to radiation, background noise and long delays between treatment and imaging readout. 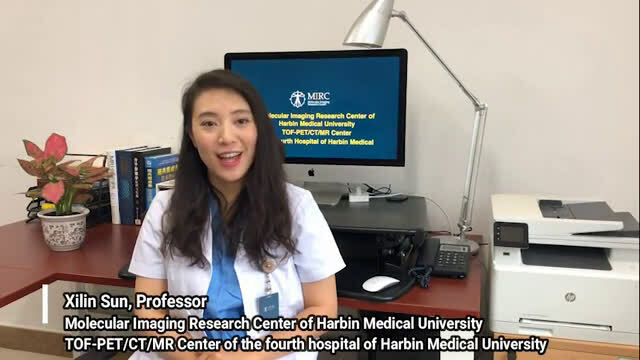 Professor Xilin Sun from Harbin Medical University discusses a new nuclear medicine tracer that could improve diagnosis and treatment of non-small cell lung cancer. Research published in the November issue of The Journal of Nuclear Medicine found that the new tracer, 99mTc-HYNIC-cMBP, produced clearer images in less time than currently used tracers and was more rapidly eliminated from the body, reducing radiation exposure. 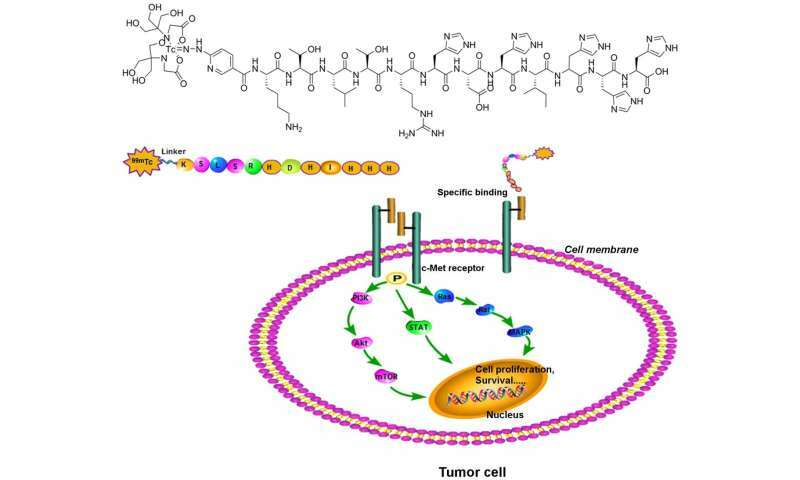 Credit: Zhaoguo Han, Yadi Xiao, Kai Wang, Ji Yan, Zunyu Xiao, Fang Fang, Zhongnan Jin, Yang Liu and Baozhong Shen, J Nucl Med Nov 2018. "To the best of our knowledge, there are no other c-Met-targeted imaging studies in NSCLC using peptide-based radiotracer to date," noted Baozhong Shen, MD, Ph.D., professor of medical imaging and nuclear medicine and the first president of the Fourth Hospital of Harbin Medical University. "Our research results confirmed the feasibility of detecting c-Met expression in NSCLC with the novel SPECT tracer. Upon further optimization, the SPECT tracer may be translated into clinical use for screening and monitoring therapeutic response in NSCLC patients."